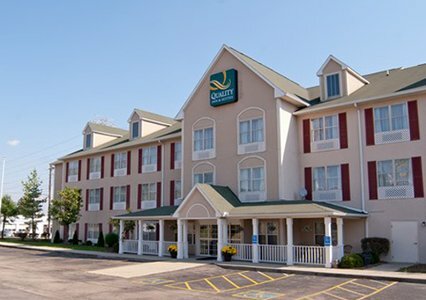 Location/ Directions: Traveling south on I-75, take exit 15 and turn left onto Sharon Road, hotel is 2 tenths of a mile on the right. Traveling north on I-75, take exit 15 and turn right onto Sharon Road. Hotel is 2 tenths of a mile on the right. Traveling on I-275, take exit 44 make a left onto Mosteller rd, then right onto Sharon rd, hotel is on the left. About Hotel: 3-Floors, 60-Rooms, Interior Corridors, Free breakfast, Free wireless high-speed Internet access, Free weekday newspaper, Free local calls, Elevator, Exercise Room, Free Newspaper Mon-Fri, Guest Laundry, Indoor Heated Pool, Indoor Whirlpool/Hot Tub, No Pets Allowed, Outdoor Parking, 100% Smoke Free Hotel, Cable/Satellite TV, Free Coffee, Hair Dryer, In-Room Coffee Maker, In-Room Desk, Individual A/C & Heat, Iron & Ironing Board, Voice Mail, Wake-Up Service. Railroad View: Good Distant View. Ask for a high room floor on the rear of the building for a railroad view. Double track railroad crosses Sharon Road near the motel. Railroads past Hotel: Norfolk Southern Railway (former Norfolk & Western, Originally Pennsylvania Rail Road). 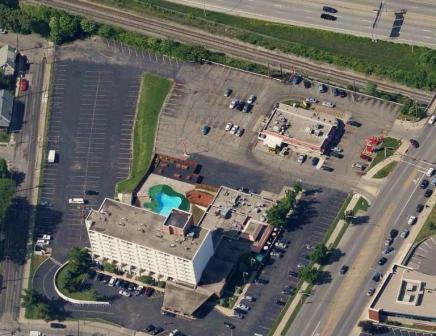 Photo Comment: The aerial image shows the Quality Inn at the top of the picture (green roof). The railroad is seen along the bottom of the picture. Third floor rooms on the rear of the building should offer a good view of passing trains. Location/ Directions: I-75/I-71 ex. 7 (SR 562, Norwood) to (SR 22 Montgomery Rd.). About Hotel: 8-Floors, 148-Rooms, Interior Corridors, Free expanded deluxe continental breakfast, Free wireless high-speed Internet access, Free access to a fitness center, Outdoor pool, Bus Parking, Business Center, Elevator, Free Coffee, Guest Laundry, No Pets Allowed, Outdoor Parking, Restaurant, Cable/Satellite TV, Free Local Calls, Hair Dryer, In-Room Coffee Maker, In-Room Desk, Iron & Ironing Board, Room Service. Railroad View: Expect only a fair view. Ask for a high floor room located on the back of the hotel. Several trees and brush may foul what should be a good to excellent railroad view from the hotel. The railroad is also below street level which makes viewing passing trains harder. 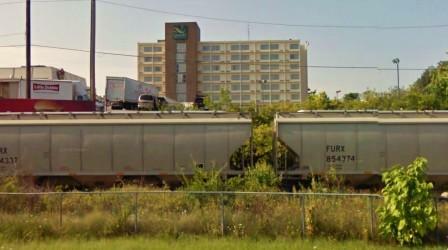 Railroads past Hotel: CSX Transportation (track owner) / Norfolk Southern (run through traffic). This line is former Baltimore & Ohio Railroad. 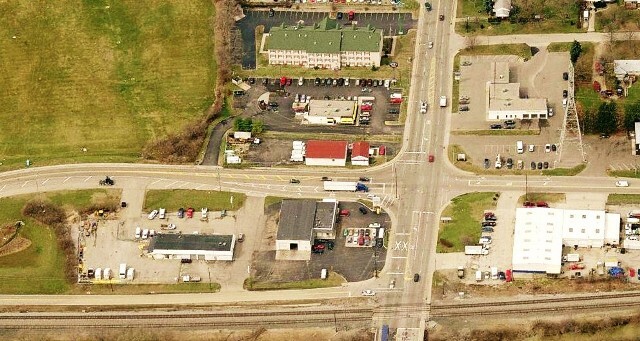 Photo Comments: The aerial photo shows the front of the Quality Hotel, the railroad can be seen along the top of the photo. Bottom Photo: A view of the hotel from Route 562 shows a passing freight train. Note the brush in the photo blocks much of the passing train on the south side (behind the train). This brush may diminish much of the railroad view during warmer months. Winter maybe a better time to achieve a railroad view from this hotel.